IVORY Clark is every teacher’s dream – she’s kind to her classmates, she’s a hard worker, and she knows how to control her emotions better than most adults. 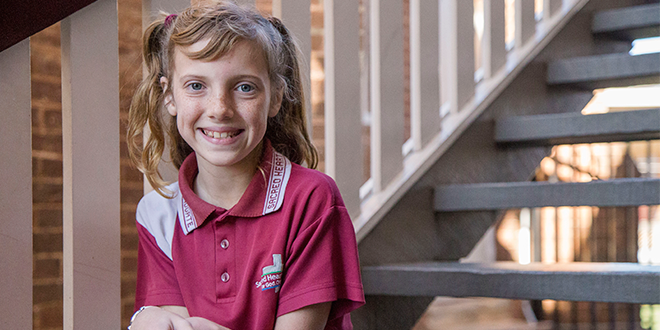 But despite her good marks, the Year 4 student at Sacred Heart Primary School, Sandgate, can’t understand why one Australian politician thinks she should be removed from her classroom. In June the nine-year-old overheard Queensland Senator Pauline Hanson suggest in Parliament that students with autism should be removed from mainstream classes and put into their own special class. For Ivory, who has high-functioning autism, Ms Hanson’s comments were more than upsetting – they simply weren’t true. “What she said really wasn’t fair,” Ivory told The Catholic Leader. “No one can tell me that I shouldn’t be allowed to be in my class with my friends. To prove her point – that people with autism can help others – Ivory sent a letter to Ms Hanson to help her “be nicer and think”. “I think she needed to read a letter so she doesn’t hurt people’s feelings and she says nice things,” Ivory said. In her letter, Ivory told Ms Hanson that over the years she has done “lots and lots of work” with a psychologist to develop her social skills, including learning about thinking before she speaks and applying a filter “so you don’t hurt others”. “I told her that she hurt my feelings and everyone else’s who has autism, and that I’m intelligent and not disruptive,” Ivory said. Ivory said despite being diagnosed with autism at two, she “feels the same as without having autism”. Ivory’s mum, Sandgate Catholic parishioner Kylie Clark, is “remarkably proud” of her young daughter. “I’m really proud that Ivory’s had the opportunity to learn that even at nine, you can make a difference,” Ms Clark said. 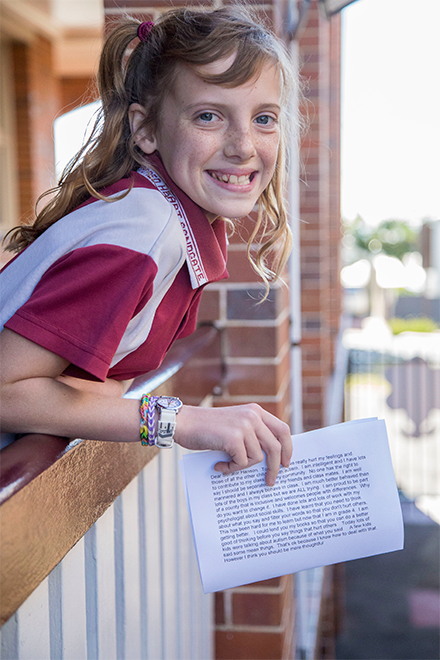 Young advocate: Ivory Clark with her letter to Pauline Hanson. Photo: Emilie Ng. Ms Clark, who is a mother of four children who all attend a Catholic school, said ever since Ivory was born, she was considered precious like the tusks of an elephant. Her name was also inspired by her grandmother Ivy, who died six weeks before Ivory’s birth. Ms Clark said Ivory had many complications when she was born, to the point where doctors were unsure if she would survive. Conceived as a twin, Ivory lost her twin sister early on in the pregnancy, and six weeks before her birth, her maternal grandmother Ivy died suddenly. Ms Clark believes the death of her mother, who was experienced in paediatric care, was for a reason. “I believe she was sent to Heaven early so she could tell the doctors what to do to keep Ivory alive,” Ms Clark said. She said she and her husband visited the doctor when Ivory was two because she presented with some developmental and social issues, including not being able to speak. The diagnosis allowed Ivory’s parents to access the right care to help her development, including psychologists and speech therapists. Ms Clark said she and other parents of children with autism never expected anybody to use their child’s diagnosis to harm them. Ms Clark said it was not the first time Ms Hanson made her feel “overwhelmingly frustrated with her lack of education”. “Because it’s such a damaging comment that can genuinely hurt a large cross-section of the community, particularly kids, and potentially that comment can sway parents’ thinking that (autism) is not okay,” she said. Ivory is yet to hear back from the Queensland senator who hurt her feelings, but she said she would be happy to talk with Ms Hanson over the phone about the issue. In the meantime, Ivory is preparing to be on stage in her local musical theatre’s performance of Beauty and the Beast in the role of one of Gaston’s admirers. Her final comments about her letter to Pauline Hanson were an ode to the woman who gave her life. “I have a great mum,” she said. Today you have really hurt my feelings and those of all the other children with autism. I am intelligent and I have lots to contribute to my class and my community. No one has the right to say I should be separated from my friends and classmates. I am well mannered and I always behave in class. I am much better behaved than lots of the boys in my class but we are ALL trying. I am proud to be part of a country that is inclusive and welcomes people with differences. I have done lots and lots of work with my psychologist about social skills. I have learnt that you need to think about what you say and filter your words so that you don’t hurt others. This has been hard for me to learn but now that I am in Grade 4, I am getting better. I could lend you my books so that you can do a better job of thinking before you say things that hurt others. Today lots of kids were talking about autism because of what you said. A few kids said some mean things. Thatís okay because I know how to deal with that. However, I think you should be more thoughtful.